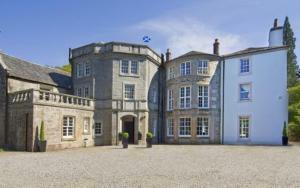 Choose from 5 hotels and guest houses in Argyll and Bute. Shown below a just a selection of the hotels available. To search within an area please use the menu on the right. Tarbet Guest House - Situated in Scotland's first National Park, this charming guest house is set high above the village of Tarbet, boasting spectacular views over Loch Lomond and towards the western side of Ben Lomond. Set in nearly 7 acres of private gardens, less than one hour from Glasgow, to the north-east side of the house is an attractive woodland which is frequented by deer and other wildlife. This includes a beautiful waterfall which feeds various deep pools on the East Burn, on its way to Loch Lomond. Tarbet House was cleverly designed to take full advantage of the site's elevated position and the stunning Loch views. With this in mind, the lounge and dining areas both have floor-to-ceiling windows, stretching the entire length of both rooms. The views from here are truly breathtaking. Patio doors open out onto a south-facing, decked sun terrace. Dungallan Country House - In a beautiful, peaceful location, overlooking Oban Bay, the Isles of Kerrera, Lismore, Mull and the sound of Kerrera, this beautiful Victorian building is now a 5-star guest house. Originally built as a summer residence by the Duke of Argyll in 1870, Dungallan Country House is situated on the edge of the town of Oban. The tranquil and secluded, yet commanding position means that the hotel offers superb views to 3 sides. Oban's promenade and the town's shops are just a 10-minute stroll away. All of the en suite rooms have been fully refurbished to a very high standard and most have magnificent sea views. Free wireless internet access is available throughout. There is a cosy and exclusive bar, offering cocktails and a choice of over 100 single malt whiskies. With a huge picture window, the bar overlooks Oban Bay. The residents' lounge is a great place to relax and read by the warmth of an open log fire. Glenavon - Glenavon is a family home within 10 minutes' walk of Oban town centre, offering rooms with TV and DVD players. All bedrooms at Glenavon share a bathroom and offer tea/coffee and a radio alarm clock. A continental breakfast can be provided in your room for a small additional cost (although this must be booked in advance). There is a limited amount of private parking to the rear of Glenavon. The Palace Hotel - Guest House - Described by our customers as having "the best view in the bay", step back in time and relax in our traditional Scottish family-run hotel. We have been awarded the FHG Diploma for 'Holiday Accommodation of the Highest Standard', and we welcome you to our home and small, family hotel. The rooms are cosy and individually decorated in a traditional style in keeping with the 100 year old building. Rooms to the front have magnificent views over Oban Bay. Golf, fishing, horse-riding, sailing and swimming are all available within a short distance. Please note that as the hotel has a 'pets welcome' policy it may not be suitable for people with pet allergies. There is a central, feature staircase in the hotel (no lift), and the lowest bedrooms are on the second floor. As a small family-run hotel, we hope that The Palace Hotel will feel like a home from home. Barcaldine House and Self-Catering Cottages - In a quiet, beautiful setting, this elegant country house offers luxurious en suite hotel rooms and delightful self-catering cottages in lush, mature grounds and gardens. Close to Loch Creran and just 10 miles (16 km) north of Oban, the heart of the west coast of Scotland, Barcaldine House & Self-Catering Cottages are set in stunning Argyll countryside. Dating back to 1709, Barcaldine House is rich in historic character and traditional charm. The house boasts spacious en suite rooms, a well-stocked lounge bar, sumptuous lounges and a stunning oak-panelled billiard room. Free wired internet is available in the rooms. The outstanding restaurant serves superb Scottish cuisine, made using the freshest, finest local produce. The self-catering cottages are set in the grounds, surrounding a bright, colourful courtyard. With all the freedom, independence and convenience of your own cottage, you can enjoy full use of the hotel's facilities, including room service, the bar, the restaurant and the billiard room.